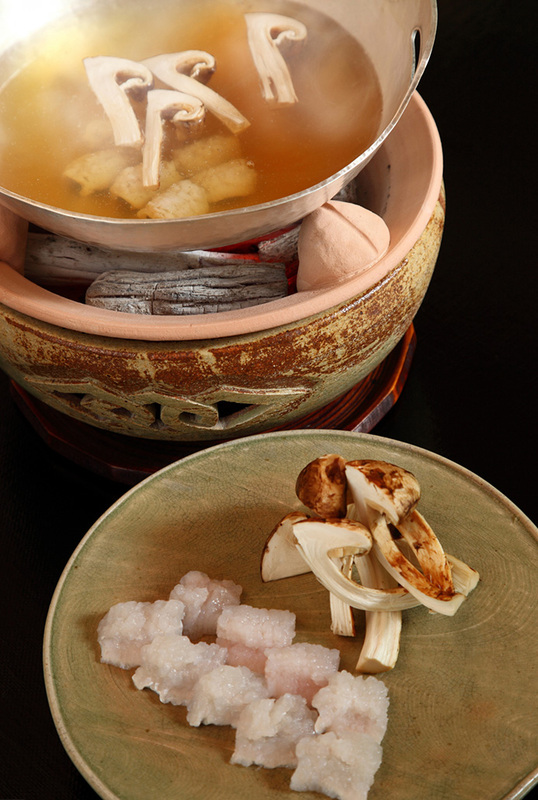 Japan's beautiful traditions, an homage to love for nature's every visage. On the wind crossing the water, hear the trees rustle and the birds sing...　open a window, and savor the richness of the moment. 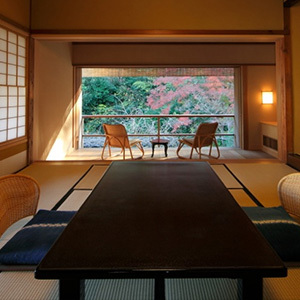 Spacious room facing the pond and Noh stage. 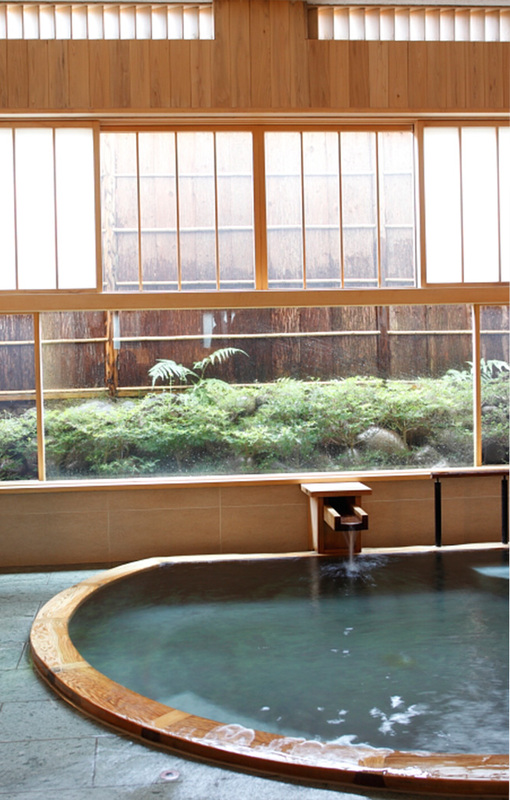 Indoor koyabuki timber bath with a view of the pond and waterfall. 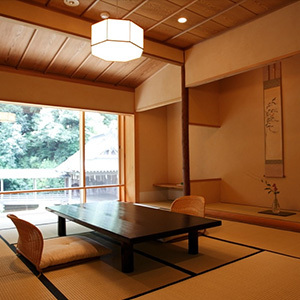 A purely Japanese style guest room with a direct view of the Noh stage. 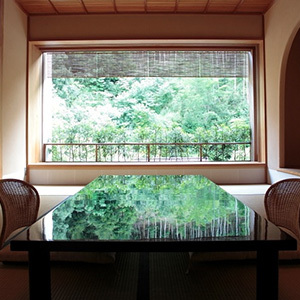 Gazing upon the bamboo bushes, this spacious room (32.8m2) has a bedroom and separate Japanese room. 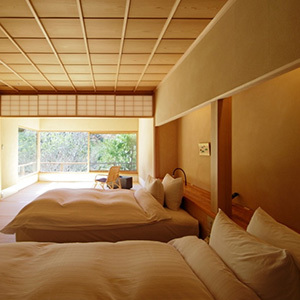 Guest room with spacious bedroom and a tatami room with a view of the bamboo bushes. 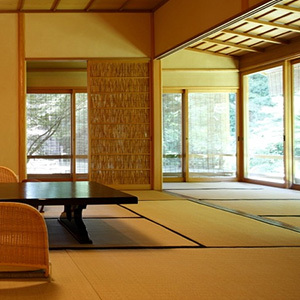 Purely Japanese style room with a front view of the Noh stage from the second floor. Blessed by new greens, autumn leaves, the gentle breeze on the river, a beautiful room in the shade of the garden. 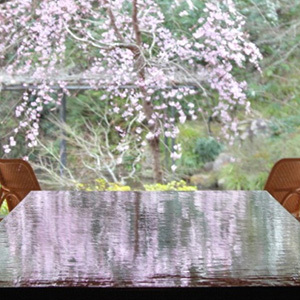 Beautiful room in the shade, facing the pond and garden, with views of sakura on heavily laden branches. 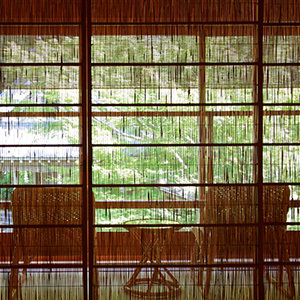 Room in the cool bamboo shade in the summer, with views of red leaves in the autumn. 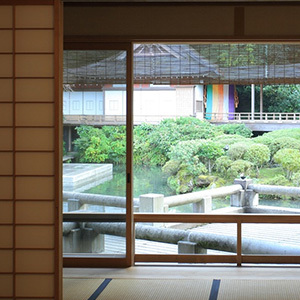 Studio room facing the Noh stage and pond. No indoor bath, the large baths, family baths and outdoor baths are available. Seasonal, fresh, cooked for this moment, this day. every bowl,every plate, every platter. Outdoor baths with pleasant breezes sweeping through the bamboo. 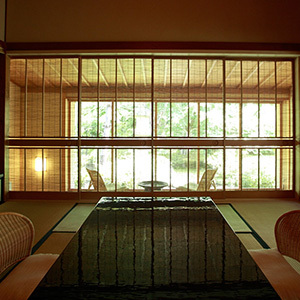 Indoor baths, crafted from koyamaki timber, available as mens' and ladies' baths. Also enjoy our carefree private baths. 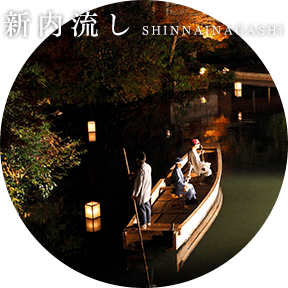 For 40 years, the "Shuzenji Cultural Journey" has brought top class artists of Japanese traditional arts like Noh, Kyogen, Shinnai, Bunraku, and Biwagaku together to give a seasonal performance. Hearing such subtle, profound music echo through the night is a once in a lifetime experience. 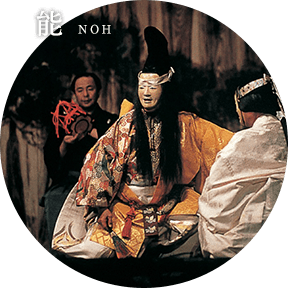 Noh combined the Kabuongyoku music loved by ordinary people with sacred dancing rites, also influenced by Zen Buddhism and ink-wash painting, and has continued to be passed down and refined through the ages. 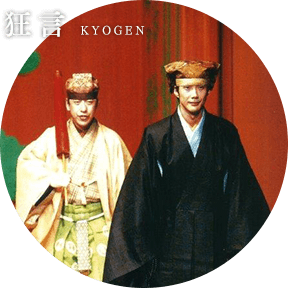 Kyogen is a spoken theatrical form centered on conversation. Its key features is humor, cutting sharply into the heart of human habits and nature and finding laughter. The one and only Edojoruri. Playing shamisen while walking around the city and inviting spectators for a "nagashi" became famous.Also featured in Kabuki and historical plays. A peaceful environment wrapped in a festive atmosphere. A special experience which will make you feel fulfilled. 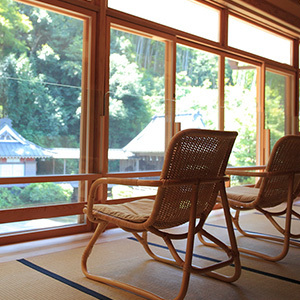 Pass some soothing moments in Shuzenji, a place which has come from eternity. © asaba All Rights Reserved.